A ferronnière is a style of headband that encircles the wearer's forehead, usually with a small jewel suspended in the centre. It was worn in the late fifteenth century and was revived in the second quarter of the nineteenth century for both day and evening wear. 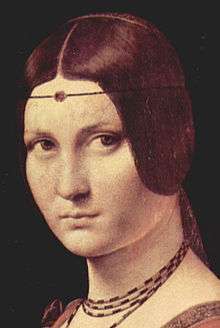 It is often said to be named after a portrait attributed to the school of Leonardo da Vinci, the La belle ferronnière, where the sitter wears such an ornament. Whilst the painting was erroneously identified in the eighteenth century as the wife of an iron merchant, Le Féron, and assumed to be the namesake of the nineteenth century ornament, the term 'ferronnière' was a contemporary 1490s term for such headbands. The nineteenth century revival of the ferronnière was worn from the late 1820s to the early 1840s, when it was considered to enhance a high forehead, and by the 1850s, it had fallen out of fashion. ↑ Lewandowski, Elizabeth J. (2011). The complete costume dictionary. Lanham, Md. : Scarecrow Press, Inc. p. 106. ISBN 9780810840041. 1 2 3 Tetzeli von Rosador, Kurt (1984). "Gems and Jewellery in Victorian Fiction". The Yearbook of research in English and American literature. Tübingen: Narr. p. 289. ISBN 9783110098990. Retrieved 18 April 2013. 1 2 Vookles, Laura (1986). The Jewelers' Eye: Nineteenth-century Jewelery in the Collection of Nancy and Gilbert Levine. Hudson River Museum. p. 102. ↑ Viardot, Louis (1870). Wonders of Italian art. C. Scribner & Company. p. 102. ↑ King, Ross (2012). Leonardo and the Last Supper. Bloomsbury Publishing. p. 293. ISBN 1408834278. ↑ Boussel, Patrice (1980). Leonardo da Vinci. Secaucus, N.J.: Chartwell Books. ISBN 1555211038.